Points leader Cody Graham is looking to finish of the last 3 races of season long South West Modified Championships on a high note as well as the rest of the IMCA Modified crew. In their last trip to the speedway Graham was off the podium but still collected valuable points as Ricky Thornton Jr., finished just ahead of the veteran Terry Belcher and the winningest driver at CAS this year Don Earven in one of the most exciting races of the year. The 43 team of Graham will be looking to return to the way the season began with a win at CAS this Saturday night. inaugural Desert Thunder Nationals at Central Arizona Speedway. $1,500 with $1,000 paid for third. Minimum start money is $150. Non-qualifiers get $50 on Saturday and $60 on Sunday. Torco Fuels presents the CDM SuperLate Models in $1500 to win slugfest Saturday night October 18th. In their last visit Jason Noll piloted the Total Seal backed 51 machine to victory lane followed by Lonnie Parker and Ricky Thornton Jr.. Thornton who holds the most wins in the Arizona Late Model series will be looking for redemption Saturday night as a motor problems kept him from challenging for the win in his last attempt at the high speed facility. With the winter drivers and fans trickling in and the CAS regulars filling the stands the racing will be electric this Saturday night. 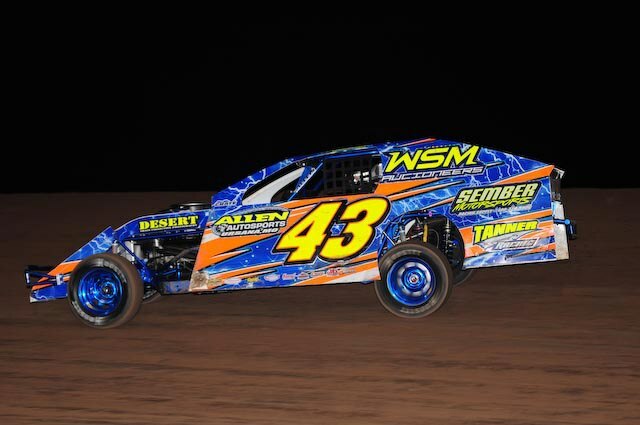 Although not leading points Don Earven has showcased he is the man to beat at Central Arizona Speedway and October 4th the competitors of the South West Modified Championships have their chance as we return to racing at the South Wests fastest track. As of this release Cody Graham, Brian Schultz and Eric Center sit 1,2,3 and are at the top of the points food chain. Chaz Baca Jr., Don Earven and Ricky Thornton Jr. all like to play the spoiler and will try and do so as we return to racing with the best in the west as we get it on on Saturday night October 4th. Don’t miss the single season appearance of the USAC Non Wing Sprint Car warriors to Central Arizona Speedway this Saturday night September 20th at 7:00pm. R.J. Johnson along with Davis, Pelkey, Deskins and the entire field of USAC sprint car stars will storm the stage of the fastest most aggressive track in the South West. Set to reach speeds over 115 mph these guys will slide side by side in the most exciting racing dirt has to offer. Along with the USAC stars, the card will aim to please as the X-Mods, Pure Stocks and Bombers return to action to Central Arizona Speedway. IMCA MODIFIEDS, XMODS, SUPERS AND MORE RETURN SATURDAY NIGHT AUGUST 16TH AT 7:30PM!!! Saturday night August 16th racing action resumes at the fastest most action packed track in the southwest featuring the IMCA Modified SouthWest Championships bringing a fantastic card of IMCA Modifieds, X-Mods, SuperStocks, Pure Stocks and Bombers. Racing action is slated to go green at 7:30pm. Along with this blockbuster card we will feature an intermission spectacular PIT CREW CHALLENGE for the Modifieds and X-Mods. Details below. Headed into the halfway point of the 2014 season Cody Graham and Trevor Miller lead their divisions going into Saturday nights feature. Consistency has been the key for both drivers thus far in the season as Graham sits 28 points ahead of early leader Brian Schultz in the 2014 SouthWest Modifieds Championships and Trevor Miller sits 8 points out front of early season leader Eric Winemiller in the SouthWest X-Mod Championships. After an action packed anticipated performance last Saturday night at Arizona Speedway the CDM Super Late Model dirt track series takes aim on Central Arizona Speedway the proclaimed fastest track in the South West. Last Saturday night Racin Jason Noll stole the show from a fast running Lonnie Parker as Parker drove away in the early part of the race to be passed mid point in the race by Noll after an apparent broken header sidelined the always fast Ricky Thorton Jr.. This Saturday night the fastest full bodied dirt track cars in the world will all do battle at Central Arizona Speedway. 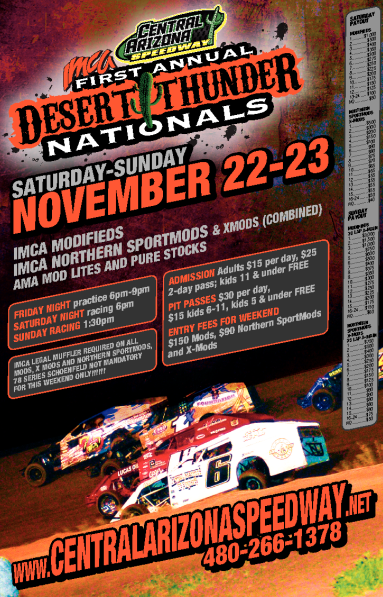 This Saturday night treat Dad right with IMCA Modified racing at Central Arizona Speedway. We will feature the best modified racers in the region for only a $12 adult ticket. Will also feature $3 Bud and Bud Lites, $2 hot dogs and a free BBQ grill giveaway to be given to one lucky person just by purchasing your general admission ticket. Along with the South West Modified Championships will be the X-Mods, AMA Mod lites and coming off a long break the Super Stocks. Saturday night May 31st the fastest cars on dirt make their debut to the fastest track in the southwest Central Arizona Speedway in Casa Grande. Rick Zeihl will lead the ASCS Wing Sprint Car division after early points leader Bob Reem Jr missed the last rd at Arizona Speedway. Lance Norick who had the top honors at Arizona Speedway 2 weeks prior will be looking for a repeat performance. Josh Williams who also put in a great run at Arizona Speedway leading more than half of the race before being over take by the eventual leaders, will look to improve on his finish and be on top of the podium. The Southwest Modified Championship return to the fastest track in the South West Saturday night May 17th at 7:30pm featuring IMCA Modifieds, Dwarf Cars, X-Mods and Pure Stocks. This Saturday night April 12th the IMCA Modifieds return to Central Arizona Speedway for the 2nd time in 2014. Anthony Madrid took the win back on March 22nd at the popular 3/8th mile facility as the fastest IMCA Modifieds in the South Wests all put on a spectacular race. With 5 different winners in the South West Modified Championships in as many nights this has truly became one of the most exciting series in dirt track today.